Remember when you chased down an ice cream truck to get a sweet and slushy Strawberry Snow Cone? 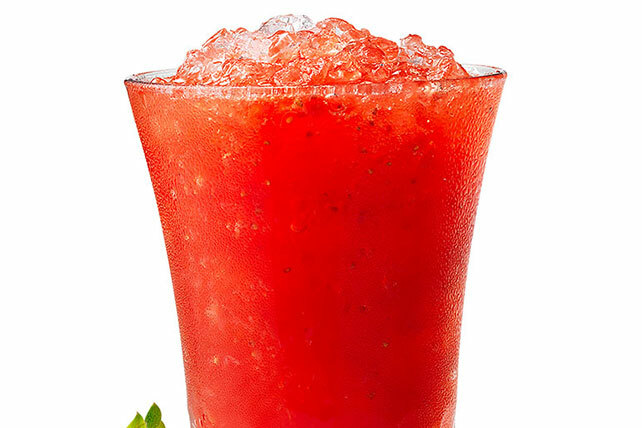 With our Strawberry Snow Cone recipe, those days are gone. Add boiling water to gelatin mix in large bowl; stir 2 min. until completely dissolved. Add berries, corn syrup and ice cubes; stir until ice is completely melted. Spoon crushed ice into 8 (8-oz.) paper cups. Spoon gelatin mixture over ice. Serve immediately. Let the kids make their own holders for the prepared snow cones. Use markers to decorate sheets of construction paper. Roll up each to form cone shape; secure with staples. Insert filled paper cups into holders just before serving. If you have more snow cones than kids, wrap filled cups well with plastic wrap; store in freezer up to 3 weeks. Remove from freezer about 5 min. before serving.